Cancun is situated on the southeast coast of Mexico in the state of Quintana Roo on the Yucatan Peninsula. The Riviera Maya is a tourism corridor in the Mexican state of Quintana Roo. It begins south of Cancun International Airport and ends at the villages of Carrillo Puerto and José María Morelos. It is composed of several cities and tourist spots. There are many reasons to choose Cancun or Riviera Maya for the MICE Business and we would love to show you why this beautiful destination is the ideal place for any group to have the best experience ever. Amusing your guests throughout your Cancun or Riviera Maya meetings, convention or event is not complicated because there are so many things to do in and around Cancun. There are many adventure tours, watersports, excellent restaurants, and of course, the renowned world class golf courses. Warm white powdery sand beaches and turquoise crystal clear waters together with the famous Mexican hospitality will make your event like no other! Cancun is one of the world’s leading premier tourist destinations worldwide. This unique Caribbean resort community features a very advanced and solid group travel infrastructure with world-class amenities and modern facilities which add up to a perfect place to host your Cancun meeting or event. There are more than 20 hotels offering meeting space. The Cancun Convention Center offers state of the art facilities. Most importantly, Cancun is easily accessible from most US airports, many offering direct flights. Guests enjoy white sand beaches and beautiful turquoise Caribbean waters with access to a range of exquisite dining opportunities, magnificent hotels and the remains of the ancient and unknowable Mayan Culture. The largest Maya archaeological site in Yucatan, Chichén Itzá is often visited on a day trip from Cancun, but is rather distant and only a small portion of the site and attractions can be seen this way. If you find the ancient Maya of interest, spend a night at one of the hotels at Chichén so you can avoid having a rushed visit. This small island is just a 20-minute ferry ride from the hotel zone or from Puerto Juarez Federal Dock, located 5 minutes from downtown Cancun. Rent a scooter to get around the island fast and cheap. There is a beautiful ecological water theme park, Garrafon, with splendid vistas on land and a magical underwater world. A beautiful site; it was one the largest Maya cities in ancient times, but much is still hidden under lush jungle. It boasts the tallest pyramid of the Yucatan Peninsula, the Nohoch Mul. Muyil boasts a lake surrounded by many Maya constructions. Xcaret is an Eco-archaeological Park located about 76km (46 mi) south of Cancun and less than 7km (4 mi) south of Playa del Carmen, in the Riviera Maya. Here you can admire tropical flora and fauna typical of the region as well as different expressions of the Mayan culture. In its facilities you can find an archaeological site, snorkeling in underground rivers, beach, butterfly pavilion, orchid greenhouse, regional fauna breeding farm, Mayan village and Jaguar Island, among others. For an additional cost visitors can swim with dolphins; enjoy the Temascal and Spa services. Riviera Maya is a collection of independent communities and fantastic hotels with full group and convention facilities that are waiting to pamper your clients in a truly unique atmosphere of modern and ancient, comfort and wilderness, all along a seemingly endless coastline of powder white sand. Accommodations amidst stunning archaeological theme parks, fascinating Mayan sites and a myriad of activities from golf to water sports await your sure to be satisfied clients. The only major Maya archaeological site to overlook the Caribbean Sea is only 128km (80 mi) south of Cancun. Not one of the larger Maya sites, but the seaside location gives it a beautiful setting. Tulum contains over 60 different structures and is believed to be one of the most important ceremonial sites for the Maya people. This archaeological zone that dates back more than 7 centuries shows the remains of a huge walled city with roads, homes and businesses by the sea. 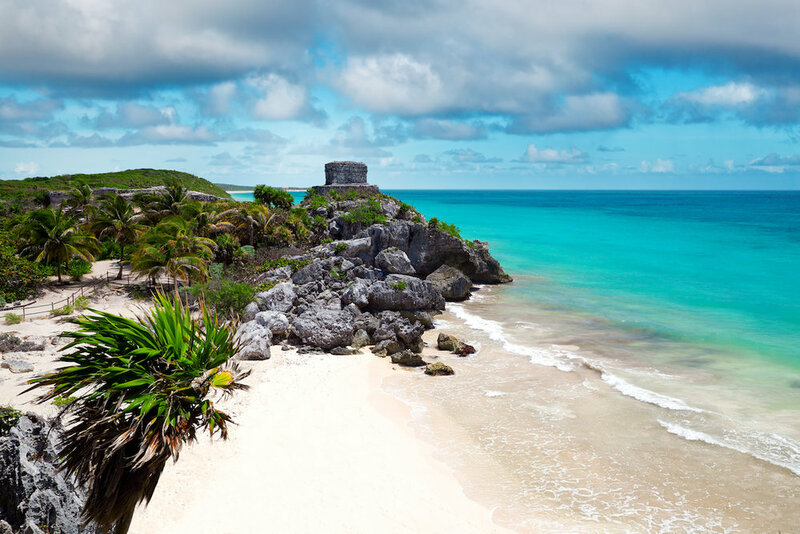 The major highlight of Tulum is El Castillo, which is a large pyramid that sits on a forty-foot cliff. El Castillo is thought to be a part of a series of lighthouses. The architecture is similar to Chichen Itza but on a much smaller scale; unlike Chichen Itza, you are not allowed to go inside or climb on the pyramids. A very pretty island and the most inhabited in all of Mexico. It is also an important Caribbean port of call. Chankanaab National Park is located here. It is well known for its watersport activities such as diving, snorkeling, sailing, boating and fishing. A small city, dating from the Spanish Colonial times, located between Cancún and Chichen Itzá with lots of period local charm. The selection of hotels and restaurants makes it a nice base for a night or two. It's a good deal closer to Chichen and other impressive Maya ruins at Ek Balam are only about 15 minutes north of town.